I have treated my control room with RealTraps and am now dealing with my console and the speaker positions. 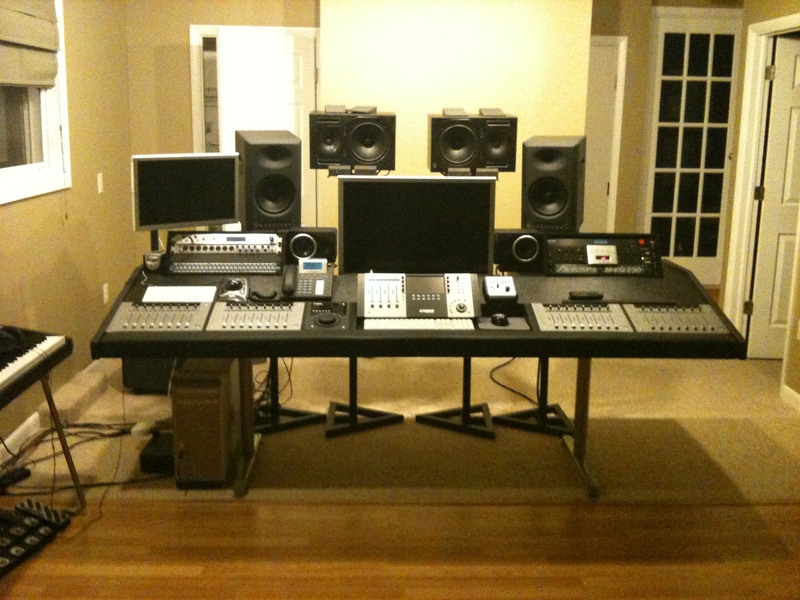 When I built my console I built it with 2 4u racks based on a nice design I saw on the forums. Unfortunately I did not think about the fact I have JBL which are not supposed to be laid on the side. This forced me to use mopads to angle the tweeter down. This was OK but I have read in many places that they should ideally be level so the sweet spot less focused down. In an attempt to improve things I pulled the 4U racks from the desk (so I can lower the speakers) and moved them to side racks. I have cut the ABS plastic for the top where they were and am now wondering the best way to set them up. The more I read I am also concerned about my nice 30" LCD. Sounds like it is an issue if the monitors are actually behind it. This is a must if I use stands as the desk is deep. Am I better with stands and being behind the LCD? Is the design flawed and should modify the desk somehow (hope not) so I can use stands and pring them further forward? Are mopads enough to decouple? What should I do with the open bay on the desk that the speakers are on? Fill with foam, insulation, sand bags?? not sure? There is also a picture of the back so you can see what I am talking about. The desk is basically a wood base, on steel legs, with wooden ribs, padded arm rest and ABS plastic on top. They should all be placed on stands set back several feet behind the desk. This would not create issues with the LCD and or reflection off the desk? If the off axis direct signal hits the back of the desk (and you place absorption there!) and any signals reflected from the floor are blocked by the bottom of the work surface, and the on axis direct signal reaches the listening position unimpeded...why would there be reflections off the downward sloping worksurface? The purpose of positioning speakers several feet behind the worksurface on stands is precisely to prevent worksurface reflections. A better question might be, how, if the speakers are placed on a meter bridge positioned above the board, with the worksurface providing an incident reflective surface, just how are reflections to be mitigated in that position? I know this is off topic but do you mind me asking how you like those JBL? I am not sure moving them several feet behind my desk is really an option as the desk is in position for there to be 3' from the wall to the back of the JBL (when on stand). Unless reducing that distance to give the speaker more behind the desk would be better. Of course I would also have to re-hang the RFZ panels (I think). This might also put the speaker in a doorway opening. ... hmm will have to investigate that. I do realize there could be reflections if on bridge to... but if brought to the front of bridge the first reflections is on angle vs being behind, the top of my desk (where bridge would be) is flat. Couldn't there be a reflection on the top (bridge) if further back as the signal is still traveling? I like them. I upgraded to them form Behringer Truths and I can say I can hear things in mixes I did not know even existed! Claro, we can't really guess from pictures if you have a problem or not. If you have amazing listening skills you could remove the screen to find out if it changes the sound. Not really obviously. Use tools and helpers instead. If you lay a mirror on your work surface and your speakers, particularly the tweeters are visible, then you have a problem. Measurement software will reveal that actual acoustic reflection much more surely and accurately. ETC. As your desk is already nicely angled down there is a good chance that you may be fine as you are. Prove it by testing though. Mopads are probably fine for decoupling, why not? I wouldn't sweat small vertical angles between the tweeter and ear. Thanks for your input... so you are saying that having the speakers on stands and angled down to clear the 4u racks is not a big deal? No, I don't think it would be a big deal. The ear does hear differently at different frontal heights/angles, but the brain is well capable of adjusting within reason. I would be far more concerned at the angle your head takes to the view screen. Bad posture can hurt. Acoustically, the desk reflection SAC and I have referred to is a much bigger issue than the height/angle one IMHO. Do you always sit when mixing? Some place speakers half way between sitting and standing ear height. Can you guess or measure the angle if the 4U was back? Then I could give a better guess. Looking at the MoPad specs it says it is 8 degrees. I use the pad and the shim and adjust the height so woofer is just above the 4u rack. Here are some pics of the JBL with the 4u in the small room before I moved it in to control room. A perfect triangle, ear level really only works for one person (or one height) who sits in exact center, same distance from desk. If he or she slides down to fader 1 or 32 all bets are off. As far as LCD, that is good height and is natural to look at. I really wouldn't worry about 8 degrees, or twenty for that matter. Use the mirror or ETC to determine if you have an acoustic reflection off the desk. If you have, a change of height and angle may fix it. Again, this is much more important than a variation off the horizontal line from tweeter to ear. Could the LCD be moved back so that it is flush with the front of the speakers? I believe this would be better. I know if the speakers on top of the desk there is reflection (using mirror). I will have to check again with the monitors back on the stands (which is further back). So I am following you, you are saying I would be better not pitching or adjusting the height as to not see the tweeters in the reflection? Seems like it would be a big angle difference and ord height change to remedy the reflection. But I will experiment with that. The only way to get the LCD flush with the monitors would be to put them up on the bridge of the desk. If they are on stands behind desk (even if inches they are behind LCD. IF they are on stands I can go wider (because I can also go back to keep triangle) - - and that gets them further away from LCD (to right and left). I know if the speakers on top of the desk there is reflection (using mirror). Are you sure? It is really only the tweeter you need to be aware of. And only at your usual listening position. If you move around looking for trouble it is nearly always possible to catch sight of the speaker. Angled desks usually lose the reflection. I am just trying to make this work as is because of your nicely made angled desk plus I think you said there is no room behind for stands? Try the height adjustment, use some telephone directories or any other temporary riser. I would have no problem if the angle from ear to tweeter was say 20 degrees or so. So I am following you, you are saying I would be better not pitching or adjusting the height as to not see the tweeters in the reflection? Can you try a something temporary, even someone holding the speaker, plus the mirror. Adjustable stands are best of course, unless you are very lucky with a fixed height. I think I will be able to find a position with no reflection if I play around. I just started a thread about screwing the stand to the floor... Not sure if it is good or bad but could be an option to modify the stands I have so they can hang over bridge a little.